We were delighted this week to receive a News Letter from our twinned school ‘Musul Primary School’ in Kenya as part of The Become a Friend project (BAF) that our school is involved in. 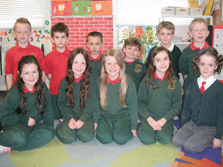 They very kindly included some photos and a write up on our pet week that we had in the junior and senior infant’s class in March (Please see page 5 of BAF Newsletter). They also shared a lot of photos and information on their own school and other schools in Kenya. Please take time to have a read through it with your child as it shows them how children in other countries live and learn. The children in Rang a 2 will receive their First Holy Communion on Saturday the 10th of May at 1pm in St. John and Paul’s Church. We would ask all children taking part in the school choir to meet there at 12:45 with your tin-whistles! All families are welcome to attend and we would appreciate your support on the day. The children in rang a 6 have been working very hard in preparation for their Confirmation which will take place in Mary Immaculate Church on Saturday the 24th at 2:30pm. We would like to wish them all the best for their special day. 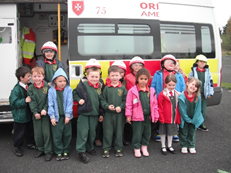 The teachers and children would like to say a big ‘Go raibh míle maith agat’ to Fireman Steve and Fireman Dave who kindly provided us with a tour of our local Fire station. The children had a talk on Fire safety and got to try out the various different safety equipment, most importantly they had a chance to spray the water hose! We would also like to thank one of our parents; Eavan Dempsey for her time and patience when she kindly gave the children a tour of the ‘Order of Malta’ Ambulance before the Easter break. Eavan showed the children all the various equipment used when administering first aid and spoke to them about the different functions of the ambulance. Míle Buíochas Eavan! 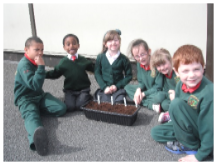 Rang a 1, 2 agus a 3 have been busy planting as part of The Incredible Edible Programme. We are delighted with our turnips, lettuce and carrots that are really beginning to take root. 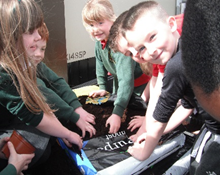 We would encourage the children to use the skills they have learnt when planting at home also and get planting for the summer! 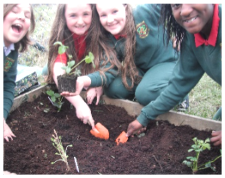 Rang a 4 agus a 5 have also been busy planting strawberries and blackcurrants in the raised planting bed area. They are making a great effort to water and weed the plants and hopefully we will have juicy fruit to eat before the summer holidays. Maith sibh, Lean oraibh!